This section has articles explaining how to maintain your concrete pavers and hardscape installations. Click on the following blue links to access these articles. Come back often for newer articles. Paver installations – driveways, patios, walkways, etc. – are very low maintenance to start. They will last for years with only marginal upkeep. If you wanted them to totally be left alone, you could do this and not worry about the structure falling apart (like concrete) or looking absolutely awful (like asphalt). Still, you may be wondering how to keep your investment looking as beautiful and strong as the day you got it. One way to further improve and maintain the look and durability of your pavers is by using a sealer. Over time, depending on the brand of paver, wind, water, and the sun might make the colors fade. Joint sand can begin to disappear, and weeds and ants can start invading your installation. Sealing pavers is a great way to prevent or reduce these unwanted effects of time. This article will explain how to seal pavers and give some hints and tips to get the biggest bang for your buck and time. There are many reasons to use sealers on your paving stones. Sealers protect your pavers from stains and water damage. The “finish” of the particular sealer may increase the beauty of the paving stone, bringing out the colors vividly. It will also make it easier to maintain, as you can easily wash away any dirt, and weeds and ants become significantly reduced. The sealer can also harden the sand in the joints, making the whole patio, driveway, or walkway even more solid. This also prevents water and ants and wind from scooping out the sand between the joints, requiring you to constantly replace and refill the sand. Sealers can be applied every year or every two years, when possible. In general, a good seal will last you around 2-4 years, though you can do it whenever you think the appearance or durability of the project requires it. However, do not seal your paving stones until the efflorescence (white chalky material) has disappeared from the pavers. This can take about three months occur. The reason for this is that the sealer not only keeps things out – it also keeps them in. Thus, the pavers won’t be able to breath to help get rid of the white chalky material if they’ve been sealed up tight. If you decide to go about paver sealing, there are some steps you should follow. First, make sure the installation is clean. You can use acids to do this, but some acids (like muriatic acid) are harsh. Look for masonry cleaners instead. Power washing will also help drastically – look for a washer that can deliver 2400 psi or more. First, give the area a good clean. Make sure no heavy dirt, weeds, stones, and other objects are on the project. Use the power washer to remove surface dirt. When power washing, spread the water from the highest point down in order to push the water down the grade. Some sand will be removed from the joints, but make sure it’s not too much.You will also want to make sure any stains or dirt is removed from the surface before you start sealing concrete pavers. This may require you to do some spot cleaning of particularly troublesome stains – otherwise the stains will be ‘trapped’ underneath the sealer, and it will be difficult or impossible to remove them after the fact. Also make sure that there are no broken or cracked pavers, and that no settling or other damage has occurred to the project. If there is, fix it before proceeding. Finally, sweep in more joint sand in order to replace any that has been lost, either over time or because of your cleaning. You should spend a lot of time on this part of the process – the more you invest here, the better the final product will look. Don’t rush! If you feel like doing a substandard job, you could outsource this to a contractor who will (hopefully!) do the job right. After letting the patio, driveway, walkway etc. stand for a few days to dry and settle, you may begin to seal pavers. With the water-based paver sealer you obtained from a store or the internet, follow the directions written for that particular sealer. Each sealer will have varying instructions, but pay attention to how it should be applied, how many coats, how long it should stand, etc. Use a sprayer, roller, or brush to evenly apply the sealer on the surface of the installation. Do not use too much, as this could damage the project. Make sure the area is dry before walking on it. WARNING: When selecting any cleaner or sealer to use on your pavers, check with the manufacturer to make sure that the product won’t do any harm to the paving stones. Always consult with your local contractor or manufacturer when you are considering sealing pavers. Some may not recommend it for you, given the climate, paver brand, or installation features. If too much sealant is used, water can get trapped – pavers need to breathe! Of course, limiting your installation’s exposure to potential stains is key to preventing stains, but sometimes it’s unavoidable, especially with driveways. As we’ll discuss below, there are ways to help protect your project against stains, but here’s another way: make them blend in. This all comes down to the paver colors you’ve selected. If you go with a single color, a stain or blemish will stand out. If you go with a blend of some kind, stains will often blend in to the pattern, making them harder to see. In addition, some types of pavers will do better against stains than others, so keep that in mind when you do your brand research Still, you may want to remove them anyway even if they are hard to see, so read on for more tips! The ultimate solution for cleaning concrete pavers is simply to remove the offending paver and replace it with a clean one. 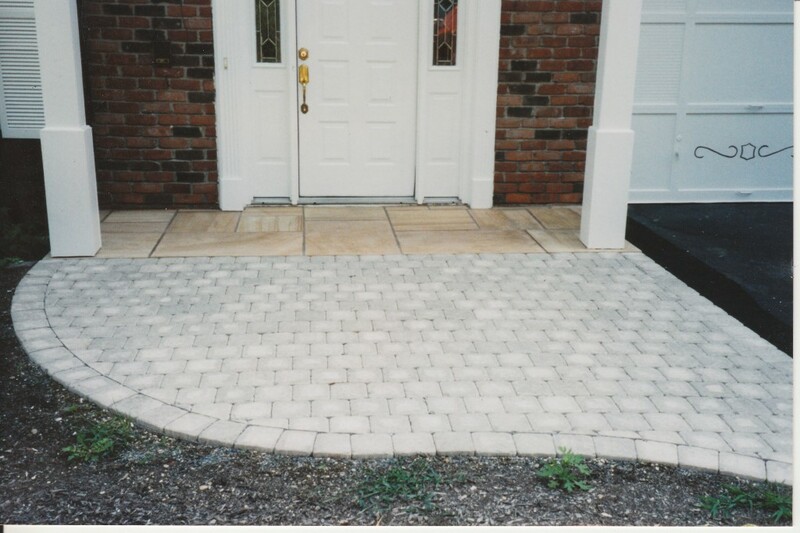 This is usually necessary when one paver (or at most a few) is severely damaged or stained. It is quite easy to remove the paver, fix the base as necessary, add a new paver, fill in with sand, and compact if needed. While this is a radical solution, it is sometimes required given the circumstances, especially if the paving stone is chipped or broken. This is why it’s important to have some spare brick on hand for replacement and repair. Ask your contractor to leave you some left over brick when the job’s done for this purpose; otherwise, see if any local contractors or manufacturers have some spare material in your blend available. You can learn more about the paver tools needed to build and maintain a installation by following the link. Less radical solutions are possible for cleaning concrete pavers besides simply removing the paver. The general rule for all stains is that the longer you wait, the more the stain will seep into the stone, making it harder to remove it as time goes on. You should attack the stain as soon as you notice it before it “bakes in” to the paver. A good general regimen for keeping your pavers clean is to do some periodic cleaning. While pavers can be maintenance free, the more care you take of them, the better they’ll look for longer. For weekly or general cleaning of pavers, water is the best choice. A hose with an attachment can easily move dirt or grime from the surface of the pavers, restoring their beautiful looks. For more stubborn dirt, you can try a pressure washer. A pressure washer may also be useful for many other kinds of stains. When using this washer, be careful not to remove too much sand from the joints; you may have to sweep sand back in to the joints to replace any that has been lost. Even if there are no stains on your paver, it is important to begin paver cleaning if you intend to seal your pavers. Doing so will improve the performance of the sealer. Once you do seal your pavers, cleaning them in the future will be much easier, as a sealer will literally guard the surface against future stains. This is probably the best preventative measure you can take, especially for driveway pavers. For a sealing pavers guide, follow the link. Before using soaps or any other cleaning product, it is best to ‘test’ it on an isolated, hidden part of the paver installation. Check this test spot to ensure that it does no harm to the color or structural integrity of the paving stones. There are many general products for cleaning pavers. One example is PaveTech. This paver cleaning product is applied to the patio, driveway, walkway, or other application and allowed to sit for 10 minutes. It is then rinsed off with a pressure washer, leaving behind pavers that look like new. Another general cleaning pavers product is muriatic acid, also known as hydrochloric acid. Be very careful with this substance, at it is highly toxic and damaging to the skin, eyes, throat, lungs, etc. Make sure you sufficiently dilute it and test it on an inconspicuous part of the installation before moving to the larger scale. Asphalt: Chill the area with ice and scrape as much away as you can. Then scrub it with an abrasive powder and rinse with water. Blood, candy, ketchup, mustard, grease from food: Let liquid detergent set on the stain for 20-30 mins and then rinse with hot water. Clean these stains immediately after they happen! Caulking: Use poultice of Denatured alcohol, followed by hot water and detergent. Chewing gum: same as caulking. Efflorescence: This is the normal residue of a white, chalky substance that can appear on the surface of the paver. It should disappear over time, but if it really bothers you, there are way to clean it, such as with muriatic acid or dedicated efflorescence cleaners. Mortar: Let the mortar harden and then remove it with a chisel. Moss and Algae: If your pavers are on the shade, you may have plant growth on the pavers or in the joints. The best cleaning product is anti-algae and moss solutions that can be purchased specifically for this purpose. Oil or grease: Mop up any excess oil and cover the rest with an oil absorbent. Leave it on stain for a day and then remove it as directed. Paint: Don’t let this stain settle in – attack it immediately! Do not wipe it as you will spread it and make it sink into the paver deeper. If it is latex paint, soak and scrub it with hot water, scouring powder and a brush. Rust: Can be removed by using muriatic acid (hydrochloric acid). Dried paint: Scrape it off and apply commercial paint remover for 20-30 minutes. Then do gentle scrubbing. Tire skid marks: Scrub them with water, detergent, and scouring powder.